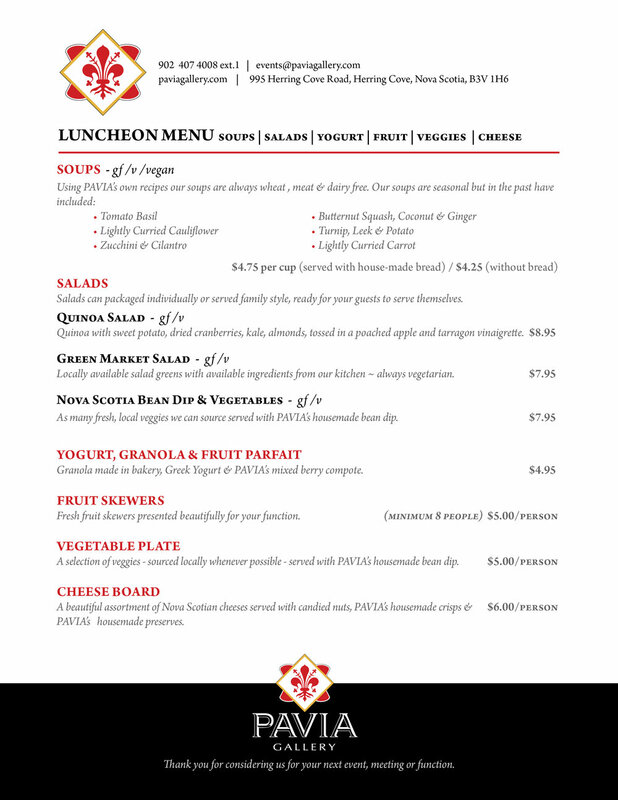 WHY choose PAVIA for your luncheon? PAVIA is proud to source as locally and as sustainably as possible. Unlike many other local restaurants and catering companies, not only are we local, but we source local, too! This means that when you choose PAVIA - Catering you can feel good knowing that you are investing in many amazing local suppliers. From the incredible ham and bacon in our sandwiches from Meadowbrook Farms, right down to the free-range eggs from Coldspring Farms that go into so many of our delicious baked goods; if we can get it near home, we do! This means that in some cases we may cost a bit more than other catering companies, but our prices are based on the prices of our suppliers. If you would like to learn more about any of our product suppliers, check out the LOCAL/SUSTAINABLE link on our website! Using our own artisanal bread, our sandwiches can be served individually or as a tasting platter and our soups are always vegan and wheat free. Our bakers make everything from scratch and can prepare beautifully presented sweets trays. And, of course, we will deliver right to you. Need some SWEETS to go with your lunch? Thank you for considering PAVIA for your next event. To place an order please call our catering office at 902 407 4008 ext.1, or email your order with details to: events@paviagallery.com Please note, your order is not official until you receive confirmation from us via email. For caterings happening at one of the PAVIA locations (Herring Cove, AGNS or the Halifax Central Library): Orders for all Breakfast/Morning Caterings and/or Luncheons must be placed 48 hours before your event. Cocktail style caterings must be placed one week in advance of your event. For caterings happening at your location or the location of your choosing: For all Breakfast/Morning Caterings and/or Luncheons must be placed 48 hours before your event. Cocktail style caterings must be placed one week in advance of your event. Servers: If your event requires servers, or an experienced barista to prepare a la carte items at our espresso bar during one of your events, we charge $20/hour per server. Cocktail-style events may require a minimum amount of servers according to Pavia’s serving standards. For events where Pavia is supplying alcohol, we are pleased to provide professional and experience bartenders. Cancellations require 36 hours notice. Custom orders or anything from our hors-d’oeuvres section (hot or cold) require 72 hours’ notice. Items cancelled after this time will be subject to a charge (which may be up to the entire quoted amount) upon cancellation.